Taro root is peeled and chopped up instead of pressure cooking the whole taro root. The chopped taro root is boiled along with tamarind till cooked. Finally taro root is fried in little oil before seasoning. Serve taro root chili fry with steamed rice and dollop of ghee. Makes: around 2 Servings of Taro Root Chili Fry. Peel, wash and chop the taro root into small pieces. Bring to boil few cups of water to boil. Add chopped taro root and tamarind to the boiling water. Boil till taro root becomes soft but not mushy. Strain the cooked taro root and discard the tamarind. Heat oil in pan, add cooked taro root and curry leaves. Fry on medium flame till taro root is golden brown in color. Remove from heat, stir in red chili powder and salt. Serve taro root chili fry with steamed rice and dollop of ghee. Notes: Make sure taro root is cooked well. Suggestions: Make sure taro root is not over cooked or under cooked. Variations: You can also add mustard seeds and cumin seeds to the oil along with taro root. Other Names: Taro Root Chili Fry. Arbi / Taro Root is pressure cooked as a whole till soft which aids in easy removal of its skin. Cooked Arbi is then chopped up and fried in little oil along with whole spices. Freshly chopped dill leaves are then added to the fried taro root along with spice powders. Serve arbi with dill leaves over plain steamed rice and dollop of ghee. 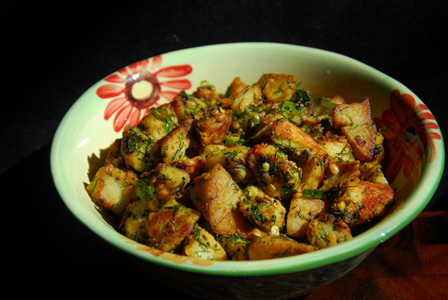 Makes: around 3 Servings of Arbi with Dill Leaves. Wash arbi under water and halve them if they are too big. Pressure cook arbi in enough water for 3 whistles. Alternatively, steam the arbi or cook them in boiling water till soft. Strain the arbi and once they are warm enough to handle, remove the skin and chop them into small chunks. Peel and grate the garlic cloves. Wash and finely chop the dill leaves. Heat oil in a nonstick pan on medium heat, add all talimpu ingredients in order. When mustard seeds start spluttering, add chopped taro root/arbi and fry them till they are golden brown around the edges. Then stir in grated garlic, green chiles and salt. Fry briefly and add the chopped dill leaves. Stir fry for few seconds and remove from heat. Serve arbi with dill leaves over plain steamed rice and dollop of ghee. Notes: Make sure arbi is cooked right. Overcooking makes them mushy. Suggestions: If arbi is not cooked well when its removed from pressure cooker, either put the back on heat with enough water and cook or peel the arbi and cook covered in the pan along with spices till done. Other Names: Arbi with Dill Leaves. Arbi / Taro Root is pressure cooked as a whole till soft. It is then peeled and chopped into pieces. Chopped taro root is fried in oil till brown in color. Finally fried arbi is seasoned with powdered spices. Serve taro root fry with spices over plain steamed rice and dollop of ghee. 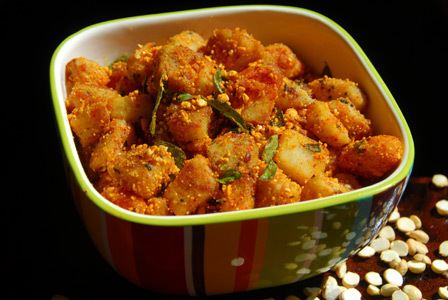 Makes: around 4 Servings of Arbi with Spices. Pressure cook arbi in enough water for 2 – 3 whistles. Strain the arbi and once they are warm enough to handle, remove the skin and chop them into big chunks. Add chopped taro root/arbi and fry them till they are golden brown around the edges. Stir occasionally to avoid the taro root sticking to the bottom of the pan. Make space in the middle of the pan, add few drops of oil, add all talimpu ingredients in order and then the ginger. When urad dal changes color, mix everything well. Then stir in coriander powder, red chili powder, turmeric powder and salt. 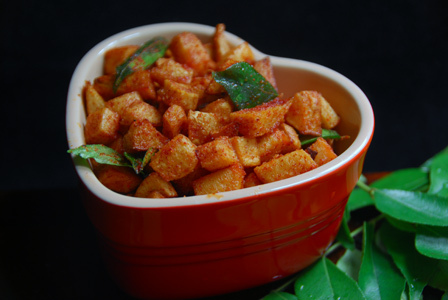 Serve taro root fry with spices over plain steamed rice and dollop of ghee. Notes: Make sure arbi is cooked right. Overcooking makes them mushy and unusable. Suggestions: If arbi is not cooked well when its removed from pressure cooker, either put the back on heat and pressure cook for one more whistle. Variations: Check other recipes with arbi / taro root here. Other Names: Arbi with Spices. Chama Dumpala Putnala Pappu Vepudu. Arbi / Taro Root is pressure cooked as a whole till soft which aids in easy removal of its skin. Cooked Arbi is then chopped up and fried in little oil along with spices. Roasted Gram / Dalia is finely ground and added to the fried taro root along with spice powders. Serve taro root fry with dalia powder over plain steamed rice and dollop of ghee. Makes: around 3 Servings of Taro Root with Dalia Powder. Grind roasted gram into fine powder along with red chile powder and salt using a spice blender. Then stir in ground dalia powder and salt (if necessary). Cook on low flame for a minute or two and remove from heat. Serve taro root fry with dalia powder over plain steamed rice and dollop of ghee. Suggestions: If arbi is not cooked well when its removed from pressure cooker, either put the back on heat with enough water and cook or peel the arbi and cook covered in the pan till done. Variations: Arbi Fry with Cilantro, Simple Taro Root Fry, Dum ki Arbi and Taro Root in Tamarind Sauce. Other Names: Taro Root with Dalia Powder, Chama Dumpala Putnala Pappu Vepudu. Arbi / Taro Root is pressure cooked as a whole till soft which aids in easy removal of its skin. It is then chopped up and fried in little oil along with spices. 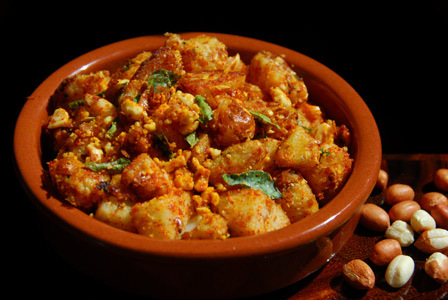 Roasted peanuts are coarsely ground and added to the fried taro root along with spice powders. 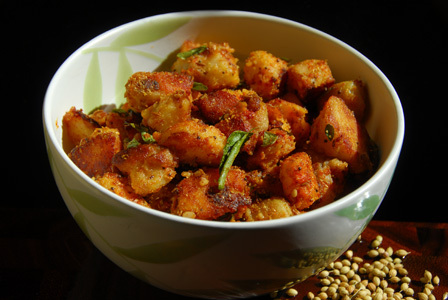 Serve taro root fry with peanuts over plain steamed rice and dollop of ghee. Makes: around 3 Servings of Taro Root Fry with Peanuts. Grind roasted peanuts into coarse powder using a spice blender. Then stir in ground peanuts powder, red chili powder, turmeric powder and salt. Serve taro root fry with peanuts over plain steamed rice and dollop of ghee. Suggestions: If arbi is not cooked well when its removed from pressure cooker, either put the back on heat with enough water and cook or peel and cook covered the chopped arbi till done. Other Names: Taro Root Fry with Peanuts, Chama Dumpala Pallila Vepudu.